Home security just got smarter, with 24/7 real-time monitoring and the latest smart technology to keep your home safe and secure. Power your home security and smart technology with Mascon high speed internet. Control your lights, thermostat, unlock doors to let friends and family and more — all from your mobile phone using the dedicated SmartHome app. Exclusive discount – Mascon customers save $10! Plans start from $18/month with discounts. Regular price of plans start at $38/month. Perfect for those looking for a basic security system. Includes over $600 in equipment value. *Includes $10 discount for Mascon residential services and $10 discount for TELUS Mobility services, with a 3-year or 5-year TELUS SmartHome Security term. Great for singles and couples living on their own. Feel secure knowing what’s happening when you’re not around. Includes over $900 in security and smart devices with this plan. Got pets, kids, or parents living with you? Know what’s happening in and out of the home to keep everybody safe and sound. Get at least $1000 in security and smart devices included with this plan. Call 1-866-832-6020 to speak with a professional Mascon customer service representative to sign up and receive your exclusive discount on TELUS SmartHome Security and to sign up for Mascon internet and TV services. $18/month for the Secure plan available to customers who have one Mascon residential service and TELUS mobility post-paid service, who have not subscribed to TELUS SmartHome Security services in the past 90 days. Offer expires June 30, 2019. Offers subject to change at any time without notice. Cannot be combined with other TELUS SmartHome Security promotional offers. Minimum system requirements apply. Final eligibility for the services will be determined by a licensed and certified TELUS technician. Bundling discount of $20/month applies to regular price of Secure, Protect and Control plans for 36 months. Full regular price applies, currently $38/month, after 36 months. Regular price is subject to change without notice. A cancellation fee applies for early termination of the 3-year service agreement. The cancellation fee is $10 per month for Secure, Protect and Control plans, multiplied by the number of months remaining in the service agreement. Available to customers signing up for TELUS SmartHome Security on a 3-year service agreement. All recurring monthly charges will be waived for any service cancelled in the 30 days following installation, promotional and installation credits will be reversed, and all equipment rental monthly fees will not apply; however, the rental equipment must still be returned to TELUS or a charge will apply. Rental equipment must be returned in good condition upon cancellation of service, otherwise the replacement cost will be charged to the account. 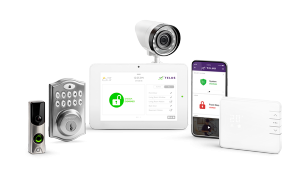 TELUS SmartHome Security installation fee applies and is $100 for customers subscribed to one or more of the following services: Mascon residential TV or high speed internet, TELUS post-paid mobility. The installation fee for all other customers is $450. These support articles can answer many of your questions.